There are two ways to update a currency within your Nusii account. 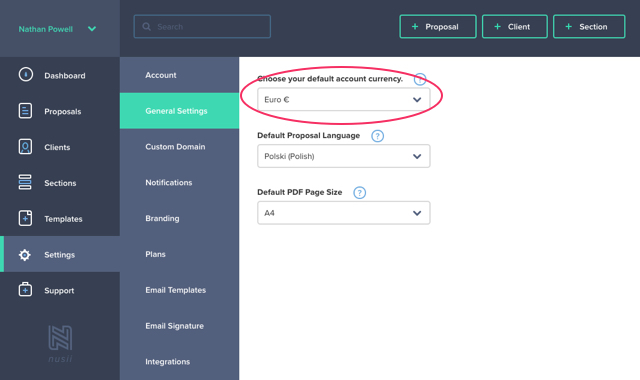 You can set up your Nusii account to work with one particular currency. This is especially interesting if you tend to work with clients from your own country. You can do this in 'Settings / General settings'. From here click the drop-down menu underneath 'Choose your default account currency' and select your preferred currency. As well as setting up your preferred currency, you can also assign certain currencies to certain clients. 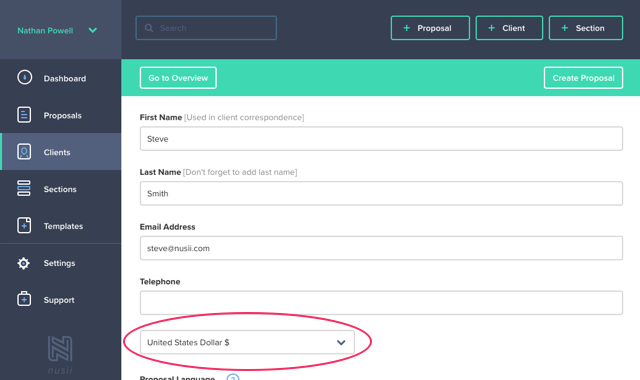 This means that even though your account level currency might be Euros, you can be certain that 'Client X', will always receive her proposals in American dollars (Or whichever currency is appropriate). To do this, select a client from your Client list (Or create a new one) and click the edit icon. From here you can select the preferred currency for this particular client. Once done, click the 'Save client' button at the bottom of your screen. From now on they will receive all their proposals in the selected currency.